Today, Gena is boldly going where no Food52 column has gone before: she's cooking tempeh. And you are, too. Sort of. Both tempeh and tofu are made from soybeans that have been shaped, in some way or another, into blocks. After that, the similarities start to dwindle. While tofu is made from soy milk, tempeh is made from whole and fermented soybeans, which makes it dense and textured. 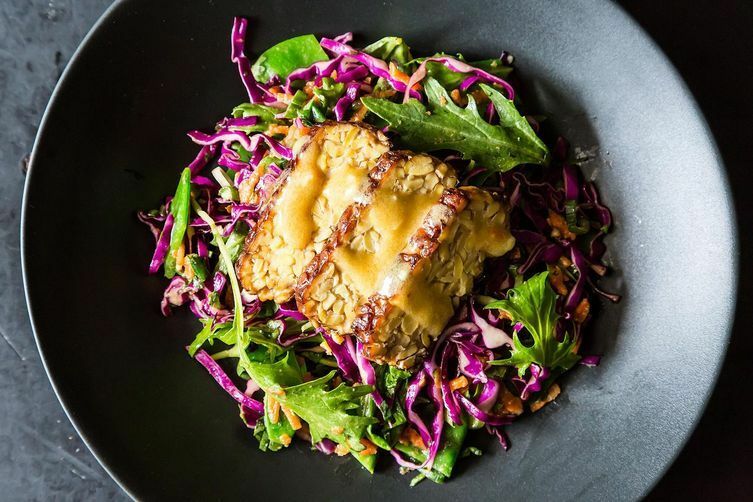 Like tofu, tempeh is versatile enough to be used in dishes from stir fries to salads, but it’s not a blank canvas in terms of flavor: it has a distinctively nutty taste, which people tend either to love or hate. Today, I’m determined to turn you into a tempeh lover. I prepare tempeh a lot of different ways: I chop it into cubes and use it in stir fries; I make tempeh chili by grating it and stewing it with tomatoes and spices; I give it a spice rub and grill it. But my favorite way to eat tempeh is still one of the simplest: I marinate it with tamari (or soy sauce), vinegar, and ginger, and I either bake it or pan fry it. From there, I serve it over salads, layer it in sandwiches, or save it for stir fries. More: Read Gena's tips for rich, satisfying salads. 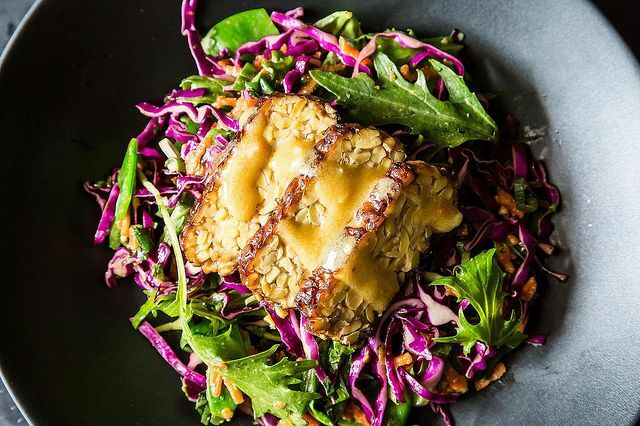 Below, you’ll find my tried-and-true recipe for marinated tempeh slices, as well as instructions for a cool, crispy salad that contrasts nicely with the earthy tempeh. I have included instructions for baking the tempeh, but my personal preference is to sear it in a little coconut oil. Once you’ve tasted it this way, it’s hard to go back! Do you have a favorite. Rand of tempeh? How do I know which one to buy? wonderful recipe!! I eat a vegan diet but am not a fan of tofu's texture...I had never experimented w/tempeh and am thrilled! I too am eating it plain (and dipped in spicy peanut sauce for a snack). I love this column. I luv, luv,luv tempeh! I'm having some right now for lunch! This looks yummy!! I've been dying for some tempe all day. Its been waiting on my countertop, and then this recipe emerged, as if I had called for it. This is fabulous. I'm afraid I simply ate the strips as is. I kept stealing slices in the test kitchen and calling them "snacks". So tasty. I really, really want to like tempeh. I've tried and tried to like tofu and just haven't been able to get there unless it's hidden in a sauce. So I'm going to try tempeh! 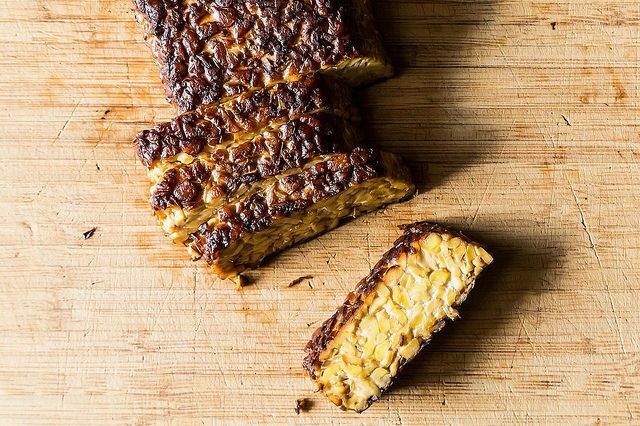 Tempeh is great because it's more inherently flavorful than tofu, and (for most people) its texture is more appealing. This is a great recipe to get yourself hooked! I LOVE tempeh! A restaurant near my old apartment had tempeh tacos and they were one of my favorite things, the crunch works so well. I can't wait to try this salad, thanks for the recipe.